TEAK WONDER® DRESSING & SEALER does not make the teak glossy or slippery, does not falsely darken the teak and does not build up an accumulation on the surface. The product is quick drying and does not smell. It is recommended that two coats are applied (with heavy brush strokes) on new teak. If teak is old or dirty, then the wood should be previously treated with TEAK WONDER® CLEANER and TEAK WONDER® BRIGHTENER, allowing the wood to dry completely before the sealing process. Another coat of sealer can be applied after 8-12 weeks without repeating the cleaning process. The product must be mixed thoroughly before use. Immediately wipe away any drips or marks on non-teak surfaces. The coverage is approximately 55-65 ft² / lt.
New teak is subject to rapid aging if not cleaned daily with fresh water or a suitable protective product applied. Most protective treatments for teak on the market are oil-based stains that have several drawbacks; they falsely darken the teak, absorb dust and dirt; in warm conditions the oil is brought to the surface and can make the deck slippery and greasy and it can also stain clothes. 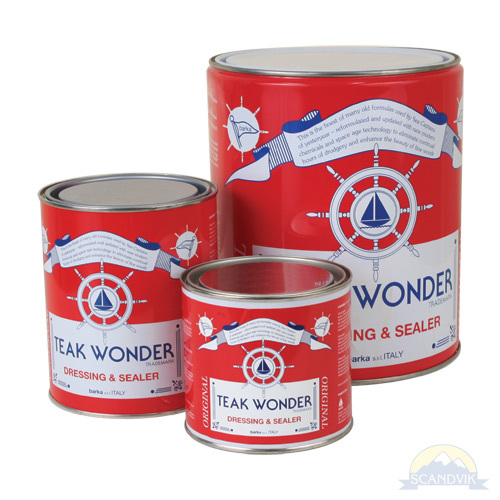 TEAK WONDER® DRESSING & SEALER is a safe and durable, non-oil based product which provides a pleasant golden color without darkening the teak or producing that fake colored look. The special components in TEAK WONDER® DRESSING & SEALER seal the wood, blocking the penetration of dust and dirt whilst protecting the natural teak oils against ultraviolet rays, slowing the oxidation and discoloration process. The sealing treatment helps inhibit the penetration into the wood of liquids such as fuel, oil, fish blood, paints, etc. As long as these liquids are not allowed to dry, they will be much easier to remove.